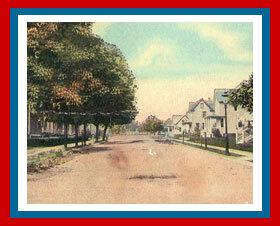 Paulsboro's first Library came into existence before the Borough was incorporated in 1904. The Paulsboro Free Library was formed in 1901, on the west side of Mrs. Elizabeth Nolen's residence located at 26 West Broad Street. Back then the rent was a small fee of $15.00 a month. The property was later sold to Mr. Frank Stines in 1911. The Library remained there until it was moved to the old Borough Hall in 1932. The first librarian was Nellie Silvers (Borden) from 1901 to 1907, followed by Adelmah Reeves (Shuster) from 1907 to 1914, and then Irma C. Lodge from 1914 to 1954. The old Borough Hall was located at 28 East Broad Street where the Senior Citizen's Center is located today. At that time the Library was a small room in the back with an entrance located on the side of the building. Paulsboro resident, Irma C. Lodge was the Librarian at this time. The library was there until it was moved to its present location at 145 East Broad Street in 1951. Mrs. Mary England Fish as a memorial to her grandparents, Matthew Gill and Mary Jessup Gill, and her mother, Sallie Jessup England, donated the present Library building to the Borough. The deed is dated January 10, 1949 and is recorded in the Gloucester County Clerk's office. (Book No. 615 of Deeds, page 383) In her gift there was also another building next to the Library but it has since be torn down to widen the road that at the present time is North Commerce Street. Before the Library could move in to the building there was much work to be done. The wooden section that was attached to the back had to be removed because it was not structurally sound. The front porch was also removed and wooden steps were installed. The Library name was changed from the Paulsboro Free Library to the Gill Memorial Library at the dedication opening on July 7, 1951 with Irma C. Lodge as its first Librarian. A rounded porch with wrought-iron posts and railings was added in June of 1959. The Library replaced this porch in 1999 with one that complemented the architectural style of the building. This building has a long history extending over 200 years and is one of the first to be built in Paulsboro according to old records of Gloucester County. This structure was made from stone brought down the river by barge from Pennsylvania. Architect John C. Clark built it for Matthew Gill in 1806. The front has two doors because the building originally served as a dwelling and a store. There was a fireplace in every room with chimney cupboards on each side. The timbers are mortised and pinned and the walls are over 18 inches thick. Proof of this can be found by looking at the deep recessed windows inside and the thick center wall that runs up the center of the building from the basement to the roof. Today, only one fireplace remains but all of the recessed window frames are still intact. Upon entering the original building you will find that the entrance hall still offers the perfect view of the beautifully polished wooden railing, spindles and banister of the original staircase. The warmth and charm of the old building makes for a very unique library that is a landmark the community can be very proud of. The building has survived through many changes over the course of its existence, from a family residence and general store to a doctor's office, and an antique shop. This cultural icon of history in Paulsboro now thrives as the Gill Memorial Library. The library now includes a beautiful addition that was completed in 2015. This addition was made possible through years of saving and a grant from the U.S. Department of Agriculture. The library’s main entrance now faces East Buck Street and the library’s parking lot. 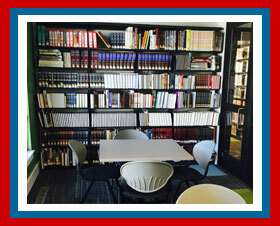 Library services have expanded over the years to meet the changing demands of our patrons. Along with books we now offer audiobooks on CD, DVD movies, notary public, nine patron computers with Internet access, free WiFi, children programs and 2 study rooms. The Library is also host to the Henry C. Loudenslager monument. 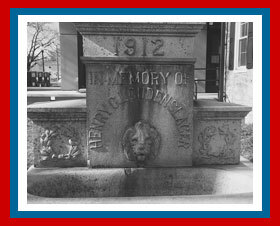 Henry C. Loudenslager was a Paulsboro resident who was a United States Congressman from 1893 till his death in 1911. This monument was in several different locations in Paulsboro before it was placed on the Library grounds on July 22, 1965. We invite all Paulsboro residents to come in to the library to view our historical collection and to get a library card. The Gill Memorial Library is a member of LOGIN and as a member of the library you will be able to use your library card to check out materials in over 20 different libraries in Gloucester, Salem and Cumberland counties. The Library is always looking for photos and other items to add to the museum collection. If you have anything you would like to donate please contact the Library. Help Us Preserve Paulsboro's Past for the Future.